Apprising Ministries continues calling out what appears to be an emerging ecumenical magisterium growing up around the ill-fated Elephant Room of seriously drifting James MacDonald and New Calvinist Mark Driscoll. Sadly, there’s a progressive New Downgrade No-Controversy going on within broader evangelicalism; and, like the proverbial frog slowly boiling to death in a pot, over the past couple of decades people simply haven’t noticed. Along with this we’ve seen the rise of the prophet-leader as head of multi-site megachurches. 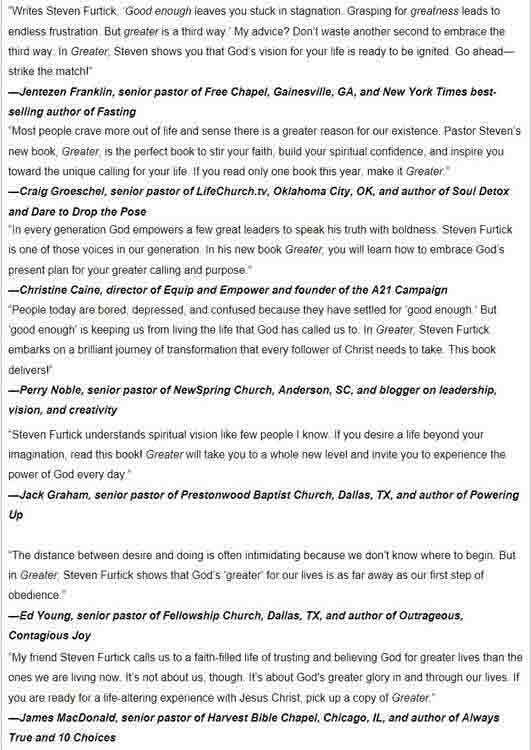 One of the most popular, and influential, among this Seeker Driven/quasi WF brood would be Steven Furtick of Elevation Church. Chris Rosebrough of Fighting for the Faith (http://www.fightingforthefaith.com) discusses Steven Furtick’s narcissistic Bible twisting in the book, Greater. In closing this, for now, consider many people have told me personally, and I’ve seen well-known evangelical names say, that Steven Furtick is teaching false doctrine quite harmful to the visible Christian community. I agree.